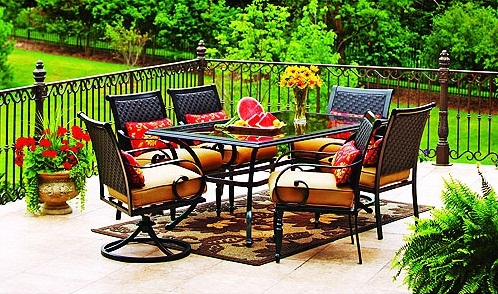 I also learned that if you’re looking for a great deal on outdoor dining furniture, many stores offer sales or clearance prices after the fourth of July holiday. In an effort to stack my great find with an even better price, I decided to wait another couple weeks to make our purchase. Bad move, as they sold out locally and online before the fourth of July without a price drop. I searched high and low at warehouse clubs, discount stores, and everywhere I could think of online and we couldn’t find anything I even remotely liked with a high or low price tag. On July 4th, we shopped at a local Home Depot for their paint sale. With my sleeping 2 year old in a stroller, I raced back to the paint section to get a few gallons of paint mixed up before the store closed. 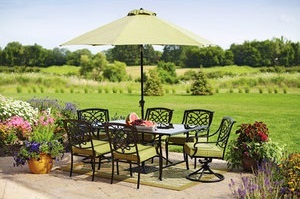 On the way out the door, we passed several Martha Stewart Living Outdoor Furniture Sets on sale! 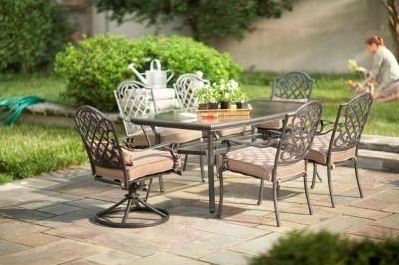 We actually liked a couple of them and decided on the 7 Piece Augusta Collection Outdoor Dining Set. It was originally $549.00 and was marked down to only $299.99! That was an even better price than I was hoping for during the after fourth of July sales. Of course the store was closed, so we called first thing in the morning and they still had 5 in stock. So after work, my husband, son, and I went back to Home Depot to make our big purchase. It looks great on our patio and is super functional. 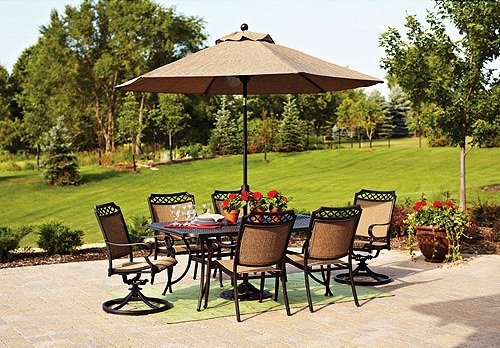 This set was not showing availability online or in the local stores when I was searching for an outdoor dining set. Even though I love online shopping, sometimes you have to go to the store to find a great deal. It’s also crazy how one purchase sometimes leads to another. In this case, a gallon of paint led to a 7 piece patio set!